Lake Orta has always been one of the best destination for bridegrooms coming from all over the world. But not only! Often is the trait d’union between different culture, very far from each other. This is the case of Cristina and Derek. She comes from Genova and he is from Scotland. A long love story and then the decision to getting married. Considering the wonderful places they both come from it is not easy making a decision. Portofino, Five Lands, Porto Venere or even some legendary castle in green Scottish country side. What a difficult choice! And here it comes Lake Orta. They immediately fell in love with it. The perfect destination for their wedding. Considering the distance it was not easy organizing all the event: ceremony, reception, flowers, music, invitation, guests coordination coming from Scotland and Ligura. They decided to hire a wedding planner specialized in Lake Orta area. Their natural choice went on Valentina Lombardi. 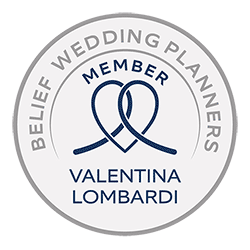 Valentina is a wedding planner with long experience on Lake Orta and she works with skillful professionals on the territory. 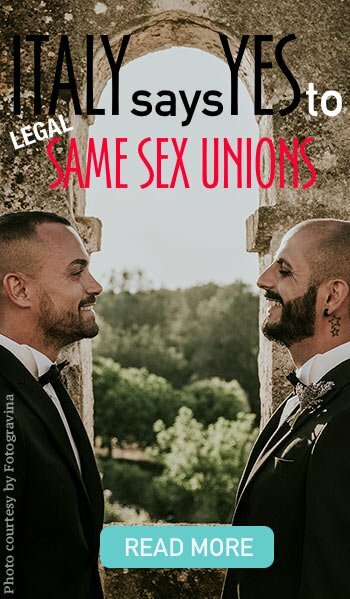 The photographer is Raffaello Mazzoleni who is the author of beautiful photojournalistic pictures that you can see in the SCOTTISH WEDDING PHOTO GALLERY for Cristina and Derek. Floral arrangements are from La Piccola Selva thanks to the fantasy and creativity of floral designer Monika Andenmatten. 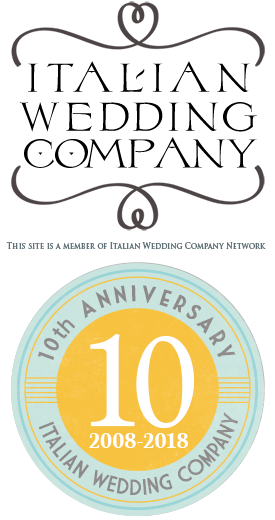 La Piccola Selva has been leader for more than 20 years in floral arrangements and bridal bouquet creation for churches and best venues on Lake Orta and Lake Maggiore. Cristina and Derek for their reception venue decided for Hotel San Rocco in Orta San Giulio. After almost an year of planning here is the wedding day. It is a hot day of the end of August. Everything is planned in every single detail. 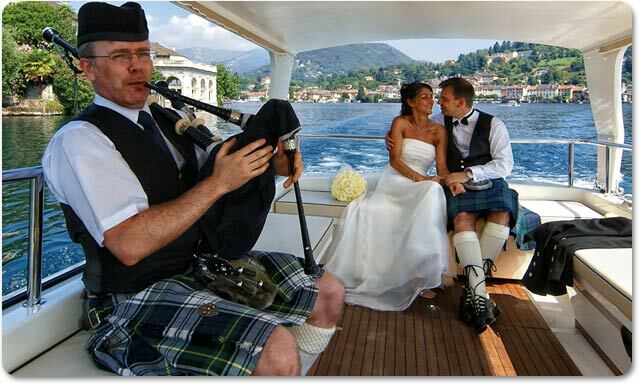 Theme for wedding is a good combination between Italian culture and Scottish one. Scotland is everywhere, beginning with pipe sound that is the perfect background of the party, and then color of flowers and most of all Derek and his brother’s family kilt. This is the traditional Scottish suit for ceremonies; it is a heavy wool skirt in tartan fabric with a unique design of fabric coming from Scotland Highlands with the sporran a little leather bag used for carrying money and whiskey! Civil ceremony is held at Villa Bossi, town hall of Orta San Giulio. Bride arrival with rowing boat is very charming with solemn pipe sound in background. Pipe and its player is the main actor of the delightful little walk that newly weds and their guests had up to Orta Main Square. It will follow Cristina and Derek also during their trip on motorboat on the lake. Cristina and Derek will also dance on pipe sound for their first touching dance a Gay Gordon. Just as in any traditional wedding theme planning, you need to look at each aspect of your bridal plans and decide how and what cultural traditions could be included. From colors to bridal attire to accent decorations, there’s much to choose from. Hotel San Rocco served a gourmand lunch with perfect service. Every table is enriched with a whiskey bottle, one for each region of Scotland, from Northen Highlands up to Islay Island. The day after for bride and groom and their guests was still party time! Every one was invited on a boat trip to watch the fireworks in Omegna at the World Championship of Fireworks. The finest part of the shoe is the famous “fire falls”, a real lightful fall that cross the lake from side to side of Omegna bay. A real sparkling closing just like Cristina and Derek’s wedding! For any information about wedding on Lake Orta please CONTACT ME.